Greetings again from the darkness. I believe the term is ‘full circle’. It was 1978, and I vividly recall waiting anxiously for the opening night start of John Carpenter’s HALLOWEEN. Now, 40 years later, I’ve just watched what is likely (hopefully!) the final entry of a franchise that spans between 9 and 12 movies, depending on which ones you count (although, apparently we are only supposed to count the first one and this latest). Carpenter’s original film gave us the backstory of 6 year old Michael Myers killing his sister Judith in 1963, and subsequently being confined to a sanitarium before showing up on All Hallows Eve in 1978 for what is now referred to as The Babysitter Murders. Writer/director David Gordon Green (STRONGER, 2017) and co-writers Danny McBride and Jeff Fradley make it clear from the start that this is a direct sequel (ignore the others!) to the 1978 original, although having a sequel and its original share the same title is itself a bit confusing. For anyone unfamiliar with Carpenter’s original classic (the one that kicked off an entire genre of slasher films), the filmmakers offer up a couple of fame-seeking British podcasters (Rhian Rees, Jefferson Hall) to spell out the history and gory details of Michael Myers and Haddonfield, Illinois. Michael has been institutionalized for four decades, never uttering a single word to his doctors … neither the now-deceased Dr. Loomis nor his protégé Dr. Sartain (Haluk Bilginer mimicking some of Donald Pleasance’s oratory style). Thanks to a not-unexpected bus wreck, and the amateurish prank of the podcasters, Michael Myers is reunited with his William Shatner mask (looking a bit rough these days) and sets off to kill innocents and track down his nemesis, Laurie Strode. The challenges of filmmakers in 2018 versus those in 1978 aren’t just limited to disposing of podcasters and teenager’s cell phones. They must also be cautious about treating women as victims, and here Laurie Strode is anything but. She has spent these years preparing herself and training her now-grown daughter Karen (Judy Greer) what to do once (not if) Michael Myers returns. Mother and daughter are now somewhat estranged, connected mostly by Laurie’s granddaughter Allyson (newcomer Andi Matichak). It’s kind of clever how the filmmakers empower the three generations so that together they may face off against the evil that has haunted their family for so many years. 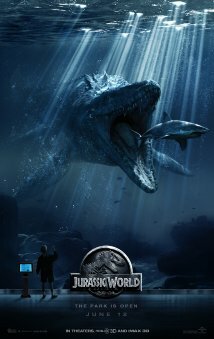 The film has a retro 1970’s look and feel, and it is well-served as a tribute/follow-up to the original. Some familiar shots are mirrored and references to the original are noted through the dialogue … though some of the humor seems a bit forced (specifically young Jibrail Nantambu who is being babysat). The opening credit sequence makes good use of the same font and color scheme from 40 years ago, and the rotten jack-o-lantern coming back to life is a nice touch. 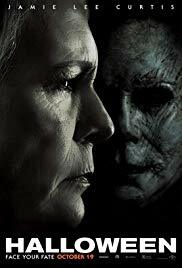 The return of Jamie Lee Curtis as Laurie is what completes this haunting circle. Carpenter’s HALLOWEEN was her big screen debut, and though she still tends to go over the-top at times, this obviously would not have worked without the daughter of Tony Curtis and Janet Leigh. In fact, this story is mostly focused on the psychology of Laurie and her PTSD, as we never learn much about what makes Michael Myers do what he does. Others returning from the original film include Nick Castle as The Shape (though James Jude Courtney shares the role this time), and PJ Soles in an all-too-brief and quite memorable appearance. As a veteran cop, and described as the first officer on the scene 40 years ago, Will Patton’s character appears to want to be anywhere but where he is (side note: Mr. Patton looks almost identical to Paul Simon these days). Huge carving knives gleaming (despite the low light) make several appearances, and many of Michael’s grisly murders are handled off camera. But don’t mistake that for a lack of violence or gore – there is an abundance. Keep in mind that the film is positioned as a direct sequel to the 1978 film, and fans of that classic should be quite satisfied. Even the iconic 1978 theme song is re-worked by John Carpenter, his grandson Cody Carpenter and musician Daniel A Davies. The recognizable notes are a bit slower and bulked up through synth. As with most horror films, it would be pretty easy to point out the flaws, inconsistencies and necessary assumptions, but it’s one of the few that actually works if you avoid thinking too much and just “enjoy” the mythology and horror. Greetings again from the darkness. Perhaps your mental picture of a grandma is the familiar form of a Norman Rockwell painting … a sweet, bespectacled little lady baking pies or knitting booties or kicking back in a rocking chair as the grandkids romp around her. If so, Lily Tomlin will jolt you into reality with her performance in this latest from writer/director Paul Weitz (About a Boy, American Pie). The film kicks off with Elle (Ms. Tomlin) breaking up with her much younger girlfriend (Judy Greer). As with many relationship break-ups, the tone shifts quickly with an increase in ‘let’s talk about it’. Elle tosses out “You’re a footnote” as a zinger that quickly ends any hope of reconciliation. It’s an uncomfortable opening scene that aptly sets the stage for what we are going to witness over the rest of the movie … Elle has lived quite a life, but has been unable to move on since the death of her long time companion – a recurring subject throughout. The six segments of the film are titled: Endings, Ink, Apes, The Ogre, Kids, Dragonflies. Don’t expect those descriptions to help you guess the direction of the film. Instead, it plays out like a road trip through Elle’s past … albeit with a very contemporary feel. See, her granddaughter Sage (Julia Garner) shows up at the house asking to borrow $600 for an abortion. Despite her career as a poet of some notoriety, Elle is tapped out at the moment. So the two of them set out in Elle’s 1955 Dodge Royal (Ms. Tomlin’s real life car), and proceed to visit people (and hit them up for cash) who have played a role in Elle’s most interesting life. During this journey – which all happens during a single day – the ladies cross paths with Sage’s clueless boyfriend (a miscast Nat Woolf), a transgender tattoo artist (Laverne Cox) who owes Elle the money she lent for enhancement, a small business owner (the final appearance of the late Elizabeth Pena) who is a bit more tough-minded than Elle gives her credit for, a long ago ex-husband of Elle’s (the best performance from Sam Elliott in years) who still carries heartbreak , and most bombastic of all, Elle’s daughter and Sage’s mom – a workaholic, no non-sense, Type A professional (played with vigor by Marcia Gay Harden). Much will be made of the film treating Sage’s decision so matter-of-factly, but it makes for nice contrast to Juno, where the decision to abort an unwanted pregnancy is abruptly reversed when she’s told the baby has fingernails. This movie even offers a tip of the cap to that scene (bravo Sarah Burns), but is never preachy or heavy-handed in its dealing with Sage. It’s a young girl in a real life situation, and she is depending on her dysfunctional family to provide financial and moral support. One might describe this as an arthouse movie with wider appeal. 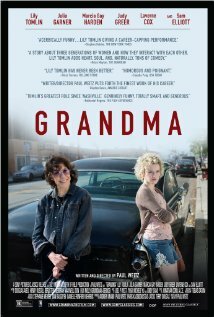 Lily Tomlin makes this a must-see, as do Julia Garner and Sam Elliott. Some will avoid it due to the abortion topic, but this is much more a story of three strong women who are related to each other – even if they don’t always relate to each other. Greetings again from the darkness. Admitting a weakness is the first step. Yes, I am a proud, long-time fan of this series. My soft spot for these films began when I was a kid – mesmerized by the 1968 original, while watching from the back seat of the car, as the clunky metal speaker hung on the window and my parents sat in the front. Oh, and yes, I was wearing my pajamas! It’s pretty much impossible to describe the technological advances in movies since Charleston Heston stumbled into one of the biggest shocker endings the movies have ever provided (and that was 46 years ago!). Heck, the advances since the 2011 movie with James Franco are staggering to see. The combination of real actors, CGI and fantastic motion capture technology make for a realistic look that is unsettling at times. Many know the work of Andy Serkis (Gollam, King Kong) who is considered the master of motion capture acting, and here he returns as Caeser, the leader of the apes. 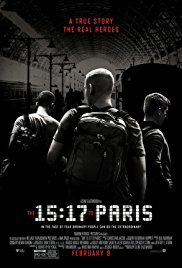 Only this time, he has real competition, especially from Toby Kebbell as Koba, his friend who was previously mistreated in the lab by humans … thereby explaining their opposite view of the few remaining humans. This entry from director Matt Reeves (Cloverfield, Let Me In) picks up 10 years after the 2011 movie. The apes have established a very cool community in the forest, while only a few immune humans survived the lab-born simian virus that was leaked. 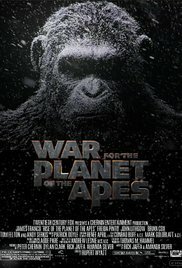 The apes have continued to get smarter and even have their own culture and code (apes don’t kill apes). The surviving humans have fought amongst themselves and only recently organized a faction with Gary Oldman’s Dreyfus as their leader. Malcolm (Jason Clarke) takes a small group over the Golden Gate Bridge to see if they can reignite a dam which could produce the energy so desperately needed in human town. Almost immediately, humans and apes meet. The big philosophical chess match begins with Malcolm and Caeser negotiating for cooperation and peace, while Koda and Drefus see war as the only solution. Alliances are drawn, fragile accords made, loyalties are questioned, and hierarchies crumble. See, it turns out the apes are like us, and we are like the apes. 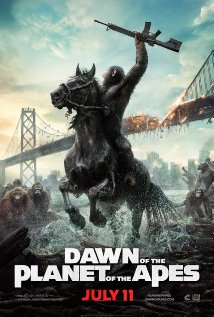 There is a terrific battle scene, but the real joy here is the personalities and look of the apes. It is fascinating to watch the interactions … and that final shot is startling! The only downside is the caricature of Carver played by Kirk Acevedo. He is the token human d-bag but his character is so over the top it ruins most of his scenes. Luckily, he has very few … and they are offset by the really cool horse dismount displayed by Caesar. If you buy into this, it’s a tension-filled jolly good time. SKIP THIS MOVIE IF: you just can’t buy into the apes thing OR you miss Roddy McDowell and his rubber mask too much to ever give the nod to CGI.